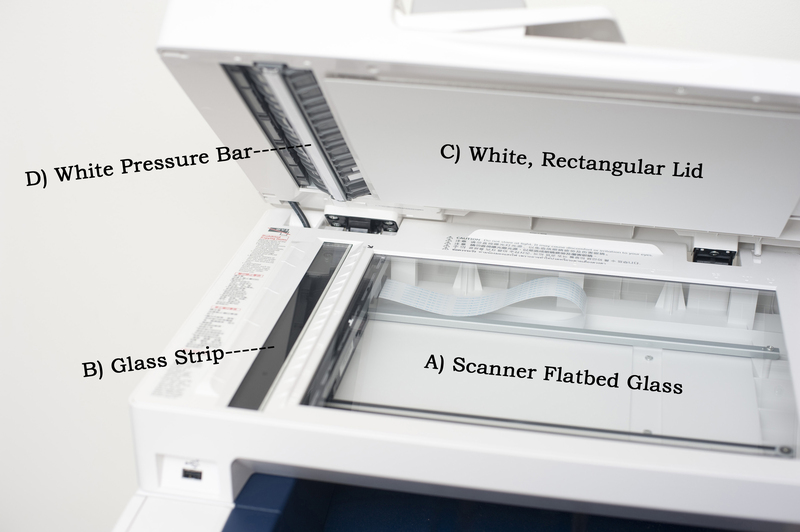 Clearing Up Vertical Lines on Copies – Laserlite Inc. If your copies, faxes, or scans are producing white or black vertical lines on the printed page, the problem is often something as small as a bit of dirt or correction fluid on the glass or ADF (Automatic Document Feeder). Here is a simple solution that works 95% of the time to clear up those lines . 2. Lift the document cover to expose the flatbed glass. A) The scanner flatbed glass. B) A thin glass strip left of the flatbed glass. C) The white, plastic, rectangular lid on the underside of the cover. D) A white, plastic pressure bar left of the white, rectangular lid on the underside of the cover. 5. Plug in the machine and make a copy to see if the vertical lines are gone. 6. If lines still appear, run your finger over the glass and side strips to feel for any stuck debris. Clean those areas well before making another test copy. It may take 2 or 3 times to completely wash off all dots of debris. Watch a video from Brother Office that demonstrates the process.